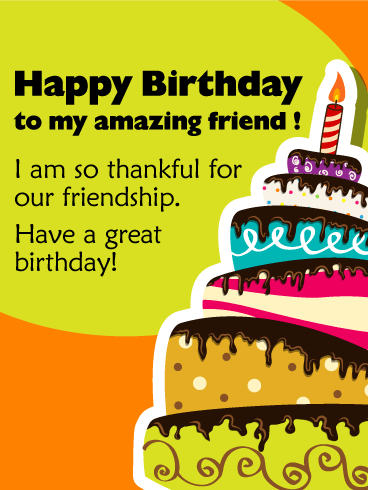 Astonish your friends with this amazing birthday card! It has everything a proper birthday needs – balloon, cake, and birthday candles waiting to be blown out. Elevate your friend's birthday with a party in a birthday card and make sure their day is really special! Looking at this, they won't be able to resist the draw of a tasty birthday cake and a good time. Make a wish for your birthday friend! Send this decadent and delicious birthday card to an amazing friend! This card boasts a funky, layer cake as tall as the Leaning Tower of Pisa. The gooey chocolate frosting drips over polka dots, stripes, and swirls to create a totally fun and unique birthday card. 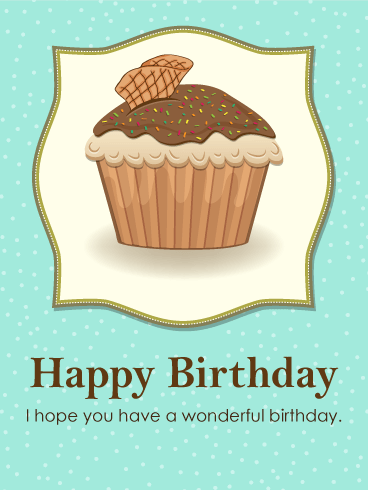 A chocolate cupcake birthday card sounds great, doesn't it? The light blue background makes the chocolate cupcake look even more delicious. We all love cupcake, and cupcake birthday cards! 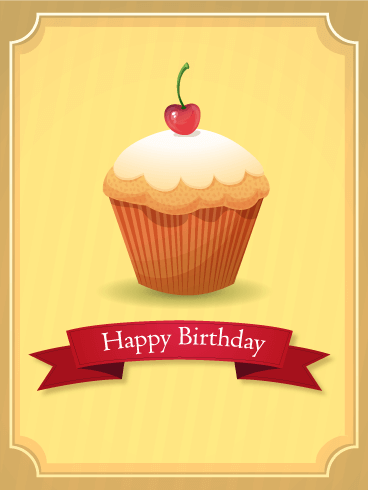 This card is definitely recommended to send to your cupcake loving birthday friends! No birthday celebration is complete without a birthday cake to celebrate the special day. The stars symbolize the happiness and excitement of birthday. This birthday card will surely make the birthday person's heart lighten and brighter. 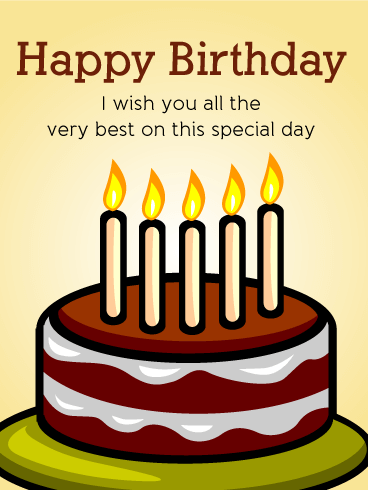 Show you care by sending this joyful birthday card. 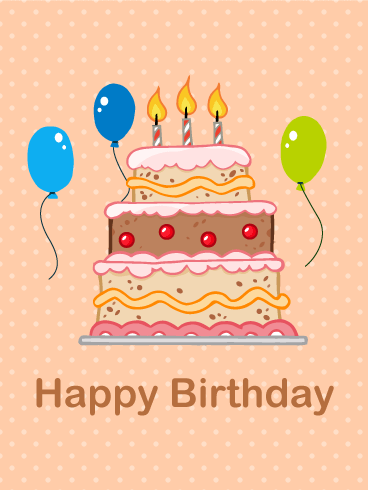 Do you like the artistic illustration of the birthday cake in this card? 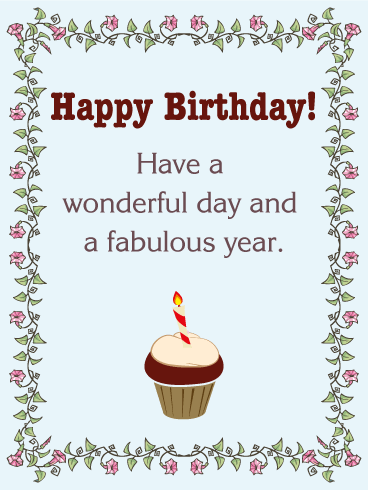 If you are looking for a simple but nice birthday card, this may be what you want to send. 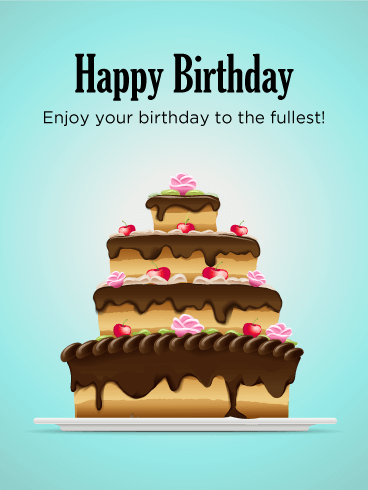 Send a thoughtful message with this artistic birthday card to celebrate special birthdays. It's time to celebrate a birthday! 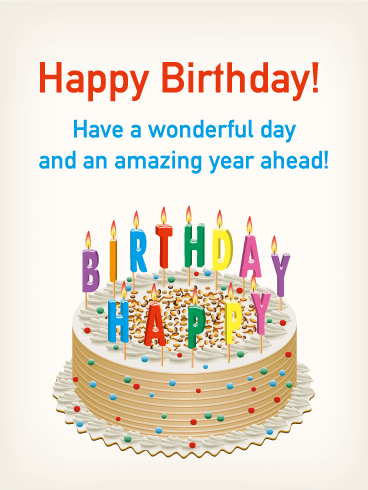 You can convey a special birthday wish with this big birthday cake and balloons card. Don't forget to add your own heartwarming message! 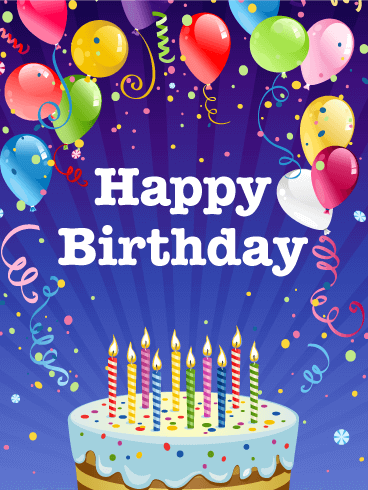 This card has everything that you need to celebrate a birthday; birthday presents, balloons and a birthday cake! 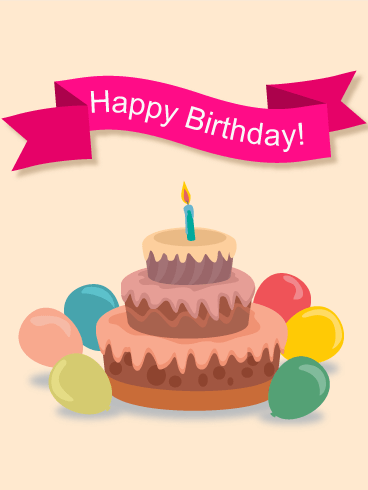 Send it with your birthday message. This card will always bring happiness to the birthday person. A multi-tiered chocolate birthday cake with cherries and rose decorations is perfect for those with a sweet tooth. Do you know a person with a birthday who really loves sweets? This card is for them! A big and sweet birthday cake definitely makes a birthday person happy. Imagine eating this cake with everyone you love. 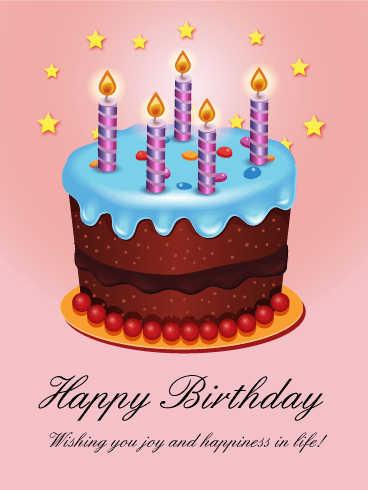 Let's send this card to wish a sweet birthday to a friend or loved one. Cupcakes are everyone's favorite. The yellow background, red cherry, and ribbon make this cupcake look more delicious. 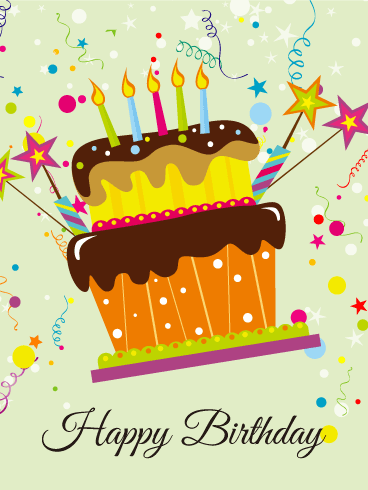 If you want to celebrate a birthday with a yummy cupcake, this card is perfect! Yum! A big birthday cake with rainbow colored candles are what we need to celebrate a special day. 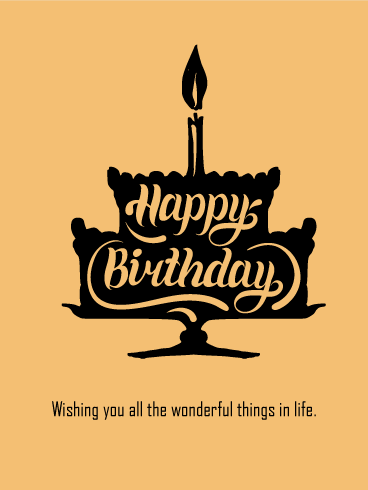 Like the rainbow candles on the cake, let's lighten the birthday person's heart by sending this card. This card will definitely make the birthday person's day brighter. It's the perfect balance. 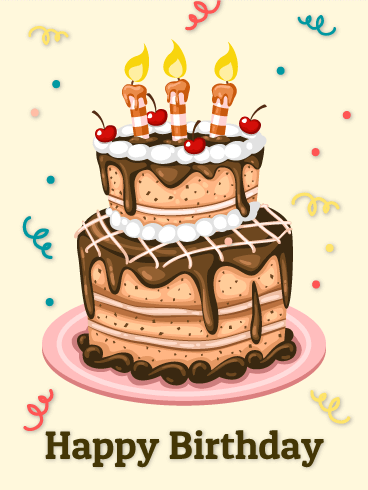 A little bit of cake... but a year full of warm and heart-felt wishes! 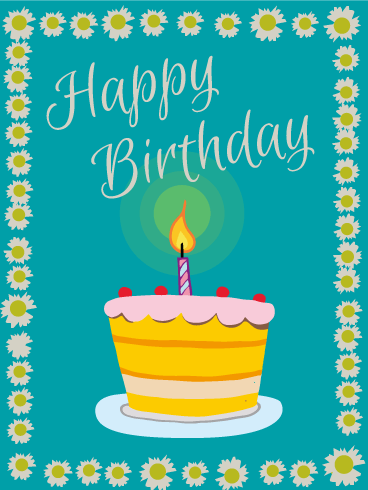 This birthday card, with its lovely flower vine border and completely yummy little cupcake (complete with a candle ready for a wish), will help you celebrate their special day in style! A wish I a powerful thing. It's the concentration of your expectations and dreams, solidified into one moment, and sent out into the universe in the hope it will come true. 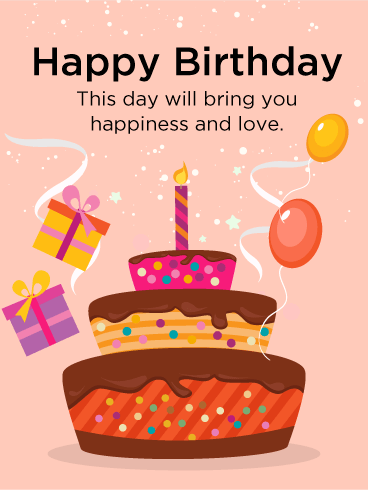 So when you wish someone special a happy birthday with a beautiful birthday card like this, more than just saying the words, you're making a wish for happiness on their birthday!